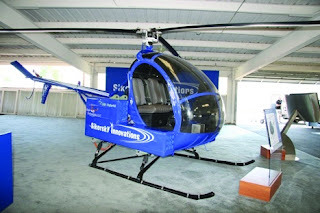 A team at Sikorsky Innovation, the technology development arm of Sikorsky Aircraft, is attempting to develop the world’s first all-electric, near-silent helicopter in a programme known as ’Project Firefly’. The team’s plan is to validate the benefits of the electric rotorcraft in flight while addressing some of the challenges of making an environmentally friendly helicopter both commercially and technically viable. The Firefly team has retrofitted a 50-year-old military S-300C design with an electric motor and digital controller, together weighing in at 180lb. Much of the S-300C’s original design has remained the same to keep costs down, with the main difference being the addition of an interactive LCD monitor in the cockpit. Two battery packs, each made up of 150 individual 45amp-hour (Ah) lithium-ion cells, are the backbone of the energy-storage system. They sit outside the aircraft much like an agricultural spraying kit, and run at 370V to provide enough power for a continuous 15-minute flight. Sikorsky claims it has increased the propulsion efficiency of the helicopter by around 300 per cent from baseline. The use of an electric motor reduces the complexity of the helicopter, cutting down on the number of components and reducing maintenance costs. There is also a reduction in vibrations and associated acoustics with electric propulsion, which could one day lead to a new series of low-observable, optionally manned aircraft for both military and civil applications. The benefits, however, sit against a long list of challenges. 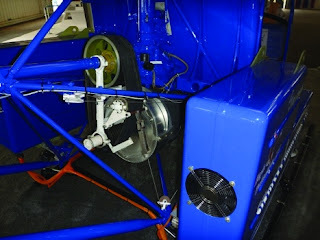 The motor must be air cooled rather than liquid cooled, and has to remain at operating temperature while sitting on the ground. Sikorsky presented this problem to US Hybrid, which came up with an adaptation of a motor it uses for surface-vehicle programmes, such as the electric-powered Humvee for the US Marine Corps. The group provided 40 per cent more power and added a number of control laws to allow the motor to run at a constant high rpm. To address this, integrated sensors were added that feed real-time aircraft health information to the pilot through an interactive LCD monitor. Monitoring of health data is done automatically through the flight-control computer and any potentially hazardous conditions are avoided with automatic system re-routing or electric shutdown. As well as providing information to the pilot, the system tracks critical stages of flight in real time allowing the team to rapidly prototype new ideas as it goes through the development programme.